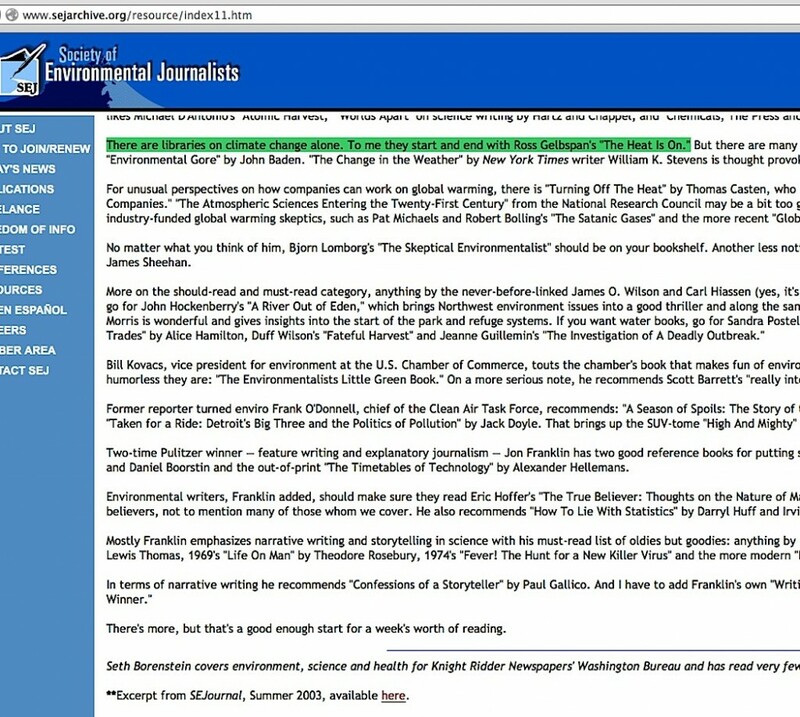 I have a “Who is Gelbspan” page right here at this blog which links straight to his own bio page; other people and organizations offer roughly similar bio/history pages. However, such things (including my own version) tell you who he is, but they don’t exactly tell you what he is. Read on, and I’ll expand on why this problem needs to be resolved. It is actually easier to explain what Gelbspan is not. • He is not a Pulitzer Prize winner, his own spin on it is as ludicrous as suggesting Leo DiCaprio is an Oscar winner because of his association with James Cameron’s Titanic movie. • He is not the first person to discover so-called ‘leaked memo evidence‘ about industry corruption of skeptic climate scientists. 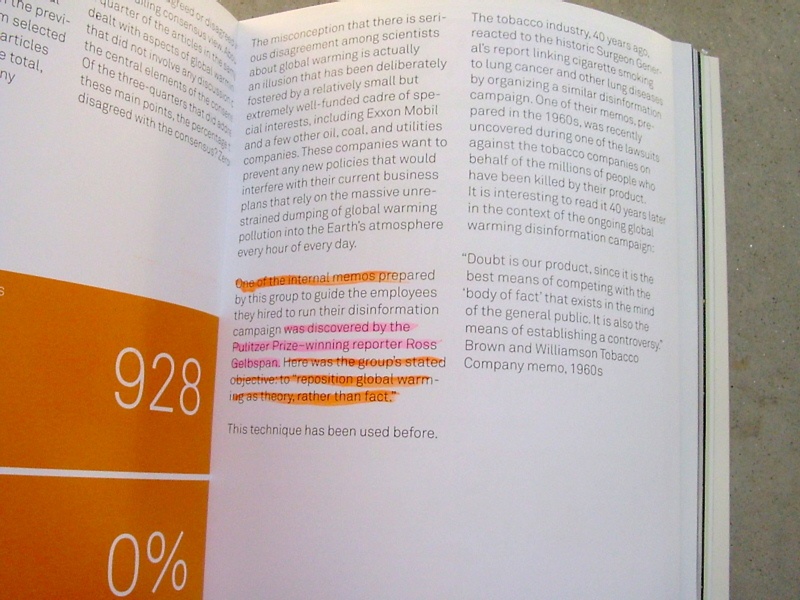 Despite former Vice President Al Gore making this declaration, along with others making the same general claim, it’s child’s play to find one of the first major repetitions of that same material years before Gelbspan ever mentioned it, and more intensive searches of that material yields results from an enviro-activist group circa 1991, …… and Al Gore’s own 1992 book. 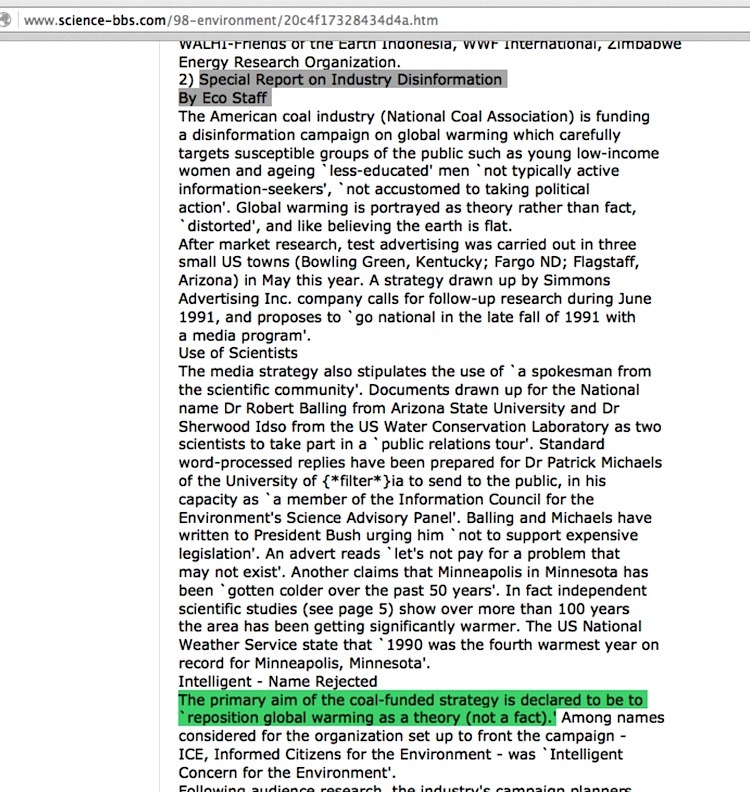 • He is not a climate expert, despite numerous claims to the contrary. 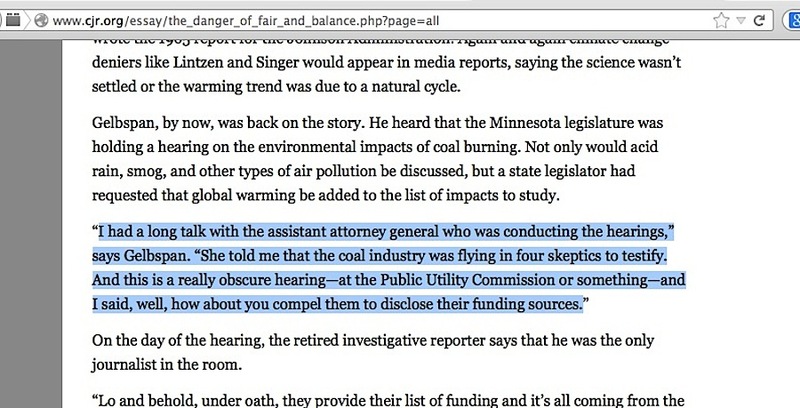 • He offers no evidence of his own to support accolades about him being an “investigative reporter.” Despite his own current website description saying he is retired from daily reporting, he said he was a working reporter when he supposedly began investigating the ‘corruption’ of skeptic climate scientists … except there seems to be zero evidence anywhere showing him to be employed, freelance or otherwise, with any news outlet at that time. 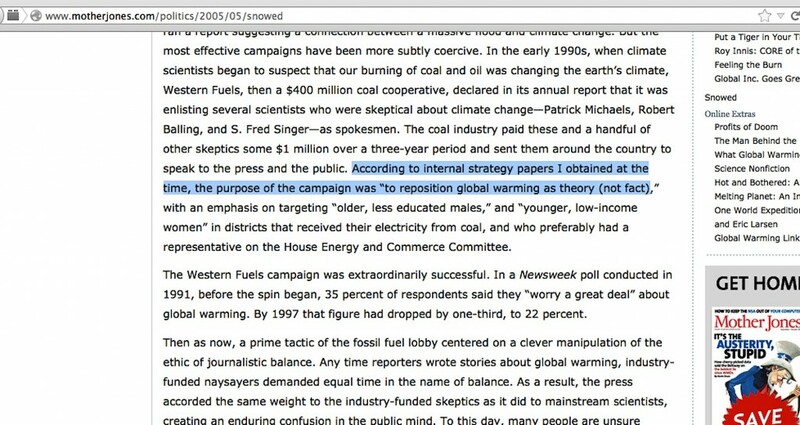 When it comes to the material leading him to the conclusion that skeptic climate scientists are paid to lie by industry people, he simply ‘obtained’ it, or ‘learned’ about it, or was ‘told’ about it. • He is technically not an active blogger. 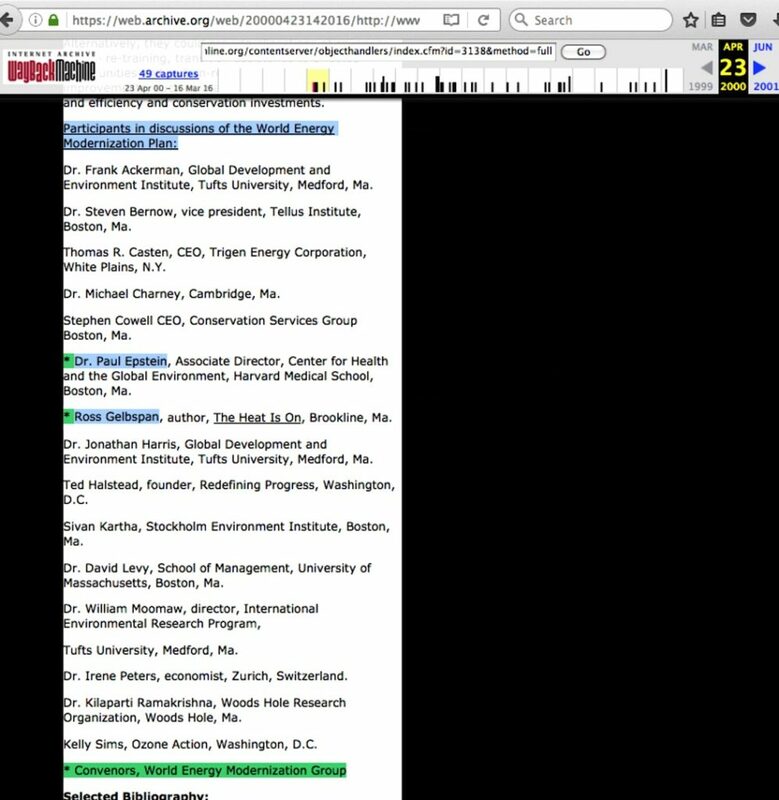 The material at his website’s home page appears to be almost entirely links to other articles, and as I detailed here, his “U.S. Press Coverage of the Climate Crisis: A Damning Betrayal of Public Trust” post – which perpetually hovers near the top of the conveyor belt of article links, seemingly recently written – is actually a rehash of a piece he wrote in 2010. 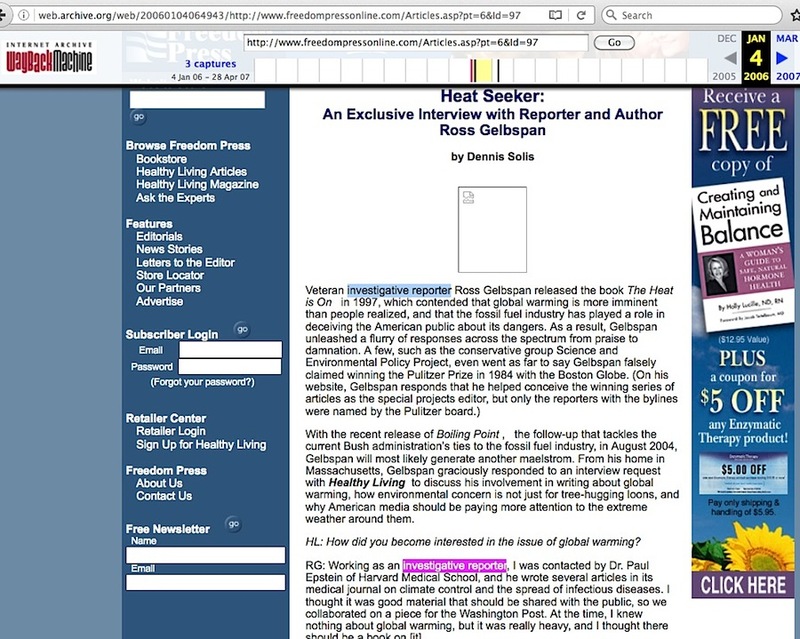 • Unlike the various famous luminaries in the global warming issue, he is not currently in demand as a lecture speaker. Go back a decade, and he was more active then. 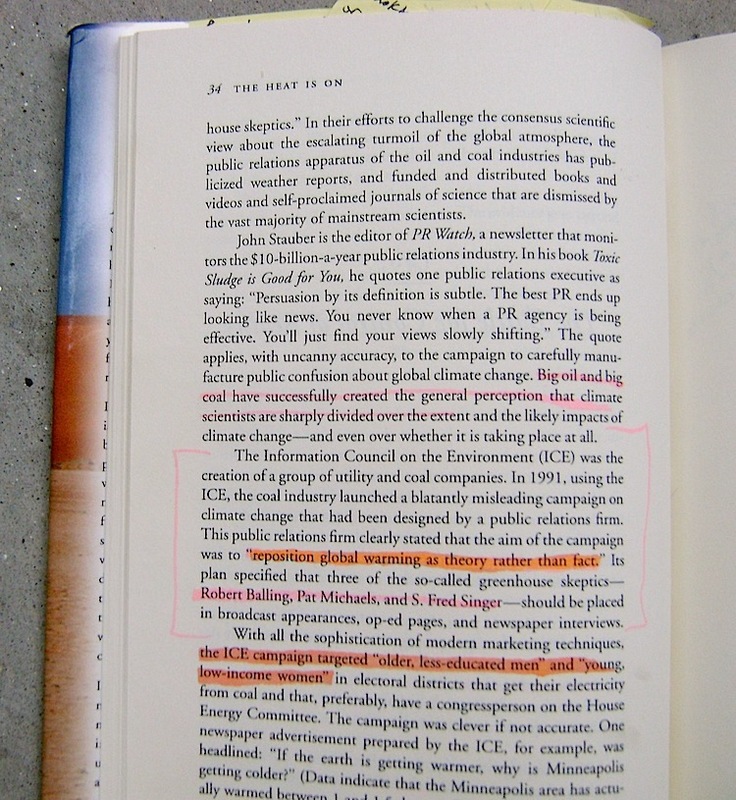 • He is not the leader/creator of any major organization, in the way enviro-activists such as Bill McKibben are. 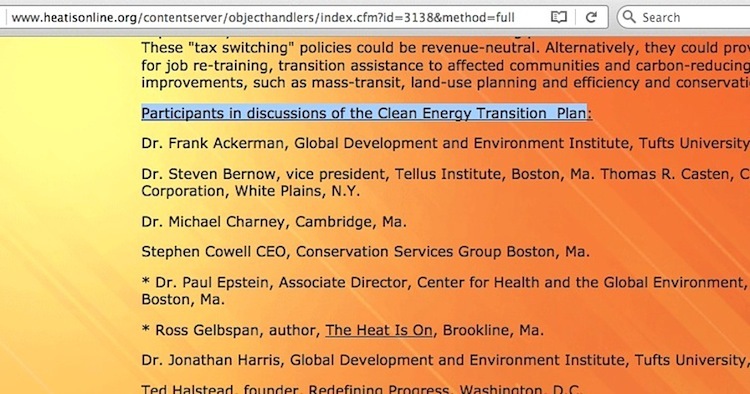 His one grandiose attempt to launch a “World Energy Modernization Plan” went absolutely nowhere (including its name, now renamed at his current website page as the “Clean Energy Transition Plan”, full text here). In fact, Gelbspan appears not to be especially active at the present time at all, beyond whatever he is doing at his website, and the repetitions of his site’s article links at his Facebook page. 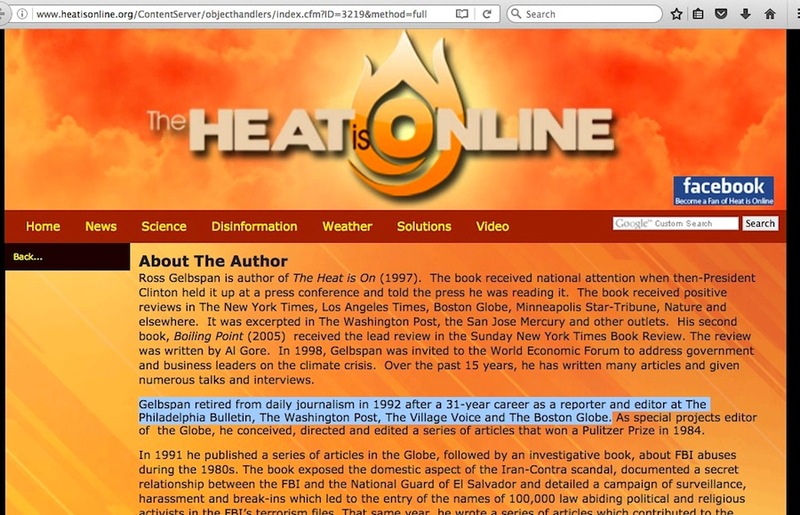 He did admit to founding Desmogblog, and was a regular contributor of blog posts there from 2006 to 2010, but it could be argued that the site was not much more than a mouthpiece for his ‘corrupt skeptics’ accusation. He wasn’t running the place nor likely was coordinating its activities, instead it simply took his material and ran with it. 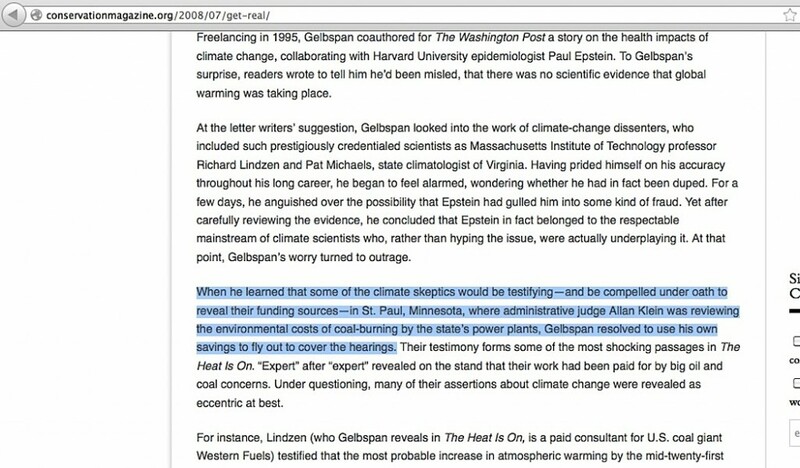 That bit, combined with all the citations leading back to his accusation about ‘industry-corrupted skeptic climate scientists’, does at least point to what Gelbspan is: he’s a man who has a very impressive sphere of influence, continuing right up to content within this last year, even without him having an active hand in the matter. The question to ask from all of this, is what paved the way for this influence to get any traction in the first place, from a man who deserves none of the accolades heaped on him regarding a ‘corruption discovery’ of which he has zero evidence to prove? President Clinton himself could have squashed Gelbspan’s entire legacy in the fall of 1997. 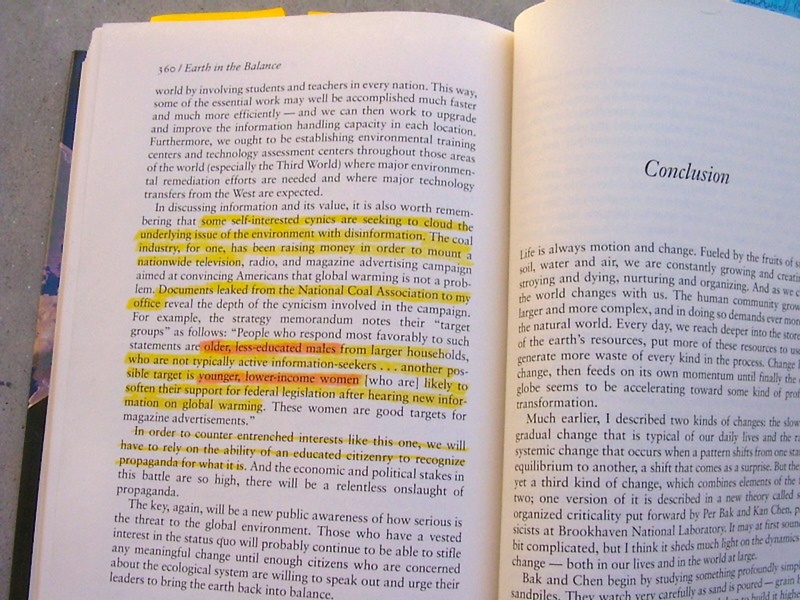 The mainstream media could have beaten Clinton to it months earlier, right after Gelbspan’s book came out. But they didn’t. Why not, considering how easy it was to find faults in Gelbspan’s narratives? The answer is beyond my limited reach; it could be answered through legal action or congressional-level inquiries where people are placed under oath and where there are requirements for documents and correspondence to be handed over. The answer is important because massive public policy decisions have been already made on supposedly science-based conclusions which leave out half the science in a monumentally anti-science way. If we are to have a public fully informed through fair and balanced journalism, this specific problem must be rectified. This entry was posted in Background by Russell Cook. Bookmark the permalink.